The windscreen-wiper mechanism needs little maintenance. At service intervals drip a little oil down the wiper spindles from outside. If they stick, the motor could burn out. In a pushrod wiper system, a gear turns a crank that operates the pushrod. Pivoted to it is a link rod that carries the wiper arms. Most problems arise in the linkage, of which there are two types — a rack and wheelbox and a pushrod. The rack-and-wheelbox linkage has a long, flexible rack — a rod with a screw thread — encased in a tube and pulled back and forth by the gear and connecting rod of the motor. In a rack and wheelbox system, a connecting rod from the gear wheel slides the flexible rack backwards and forwards. The rack tube may curve from the motor to the screen. The wiper arm spindles are mounted on cogged wheels that engage with the rack to provide a swinging motion. Wheelboxes (usually two) mounted on the tube each have a gear wheel that meshes with a stretch of exposed thread on the rack. The wheels convert the rack movement to the swinging action of the wiper arms mounted on the wheel spindles. The other type of linkage has a pushrod pivoted to the gear crank. The pushrod pushes and pulls a rigid horizontal link rod (or two parallel rods) with a wiper-arm spindle at each end. The rack tube is secured to the motor by a nut. Loosen it to free the tube. A wheelbox mechanism can become prone to sticking, or the wheels can wear and allow excessive play so that the wiper arms move too far. To check whether a wheelbox is sticking, lift the wiper arms off the screen and remove the motor gearbox cover. Unscrew the nut locking the tube to the gearbox, and unfasten the rack from the connecting rod by removing a circlip and washer. Lift the rack clear. To remove the rack, unclip it from the connecting rod and lift it upwards to free the U-shaped retainer from its slot. Hook a spring balance to the end of the rack, hold the tube and pull the rack until the wiper arms move. Measure the weight of the pull. The force needed should not be more than 6 lb (2.7 kg). If more force is needed, the wheelbox and rack may need lubrication, or the tube may be curved too sharply away from the motor. No bend should have a radius smaller than 9 in. (230 mm). You can shape the bend by hand. Remove the two screws holding the wheelbox together. Pack the box with high-melting-point grease. To lubricate the rack, withdraw it from the tube and grease it with high- melting-point grease. When rethreading, reposition it so that the unworn threads are against the wheelbox gear wheels. Lubricate the wheelboxes with the rack removed. Take off the wiper arms and the nuts securing each spindle, noting how washers and spacers under the nuts are arranged. Undo the two screws holding each wheelbox together and pull out the tube from each side. Pack the boxes with high-melting-point grease and reassemble. Some arms are held by a spring clip. To remove, lever the clip up and out. If the wheel teeth are worn, turn the wheels through a half circle so that unworn teeth mesh with the rack. On a pushrod linkage, the wipers lose efficiency because of wear or damage to the linkage pivots. Replace any faulty parts. 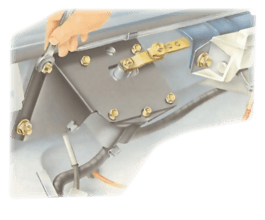 If the wiper motor remains dead or blows the fuse repeatedly, look over the wiring for poor or broken connections. If you find none, use a circuit tester to check if current is reaching the motor. Clip the lead of the lamp to earth and hold the probe to the live terminal of the motor. If there is current, the tester will light. If it does not, check if current is reaching the switch. If it is, search for a wiring fault between the switch and motor or within the switch. If necessary, continue checking back to the ignition switch and fuse box. If the motor is receiving current but does not work, take it out and check it (See Fixing a windscreen wiper motor).